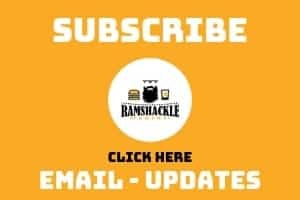 March 19, 2018 (Last Updated: March 9, 2019) - As an Amazon Associate I earn from qualifying purchases. Alright, ladies and gentlemen, the past few weeks have culminated in the recipe we are sharing today. We have looked at the history of the hotdish, made the first printed hotdish, and have made the elements of our hotdish. Today, we are putting our pieces of the puzzle together and making our best homemade tater tot hotdish. We are getting nerdy about this. Everything is from scratch in this recipe. Go Straight To The Recipe. We previously made homemade tater tots, and we are going to ask you to make a double batch of that recipe for this from scratch hotdish. You can either make these at the same time or you can premake these little guys anytime before and include them in this recipe. While I am not a regular at the deep fat fryer, it was fun to take a stab at making tater tots. As an alternative, you can use a one-pound bag of tots. Yes, it is easier to pull out a bag of the premade stuff, but this particular recipe isn’t really constructed for premade. We are doing things from scratch today. It should not shock you that we made our own cream of mushroom soup recipe, as well. This recipe is going to make it into regular rotation in our house. It is super tasty and there are some variations of this that would make it great for gravy and the like. With a vegetarian in the house, gravy can sometimes be an obstacle and this had a great base for making a veggie gravy. Not to mention, the soup is excellent. This is another one that you could either make previously or include as part of making this. I understand that there might be lots of dishes accumulating for this recipe. This really is up to personal preference. I am going to use 1 cup of corn that we harvested this last fall and froze. 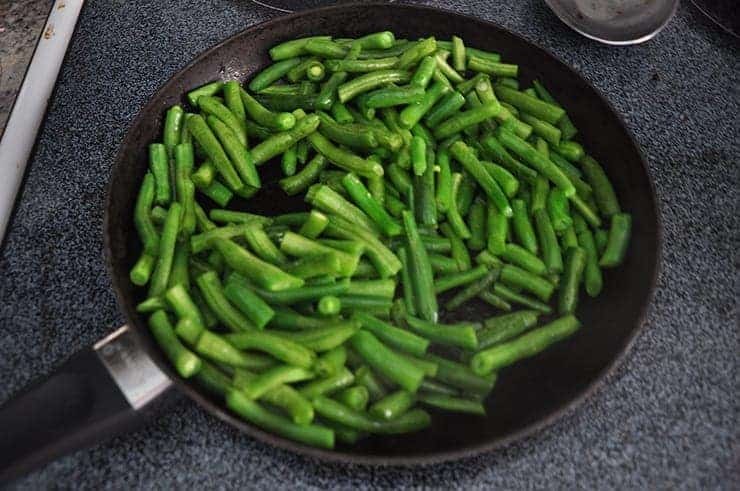 We are also going to use half a pound of sauteed fresh green beans. You want the equivalent of 4 servings of veggies, as our final product makes 4 servings and I figure one serving of veggies per serving is about right. 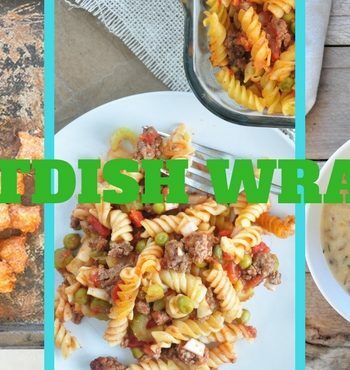 While the traditional hotdish really gets a bad wrap from foodies, I think making this dish from scratch really brings an interesting dimension to hotdish. Our best homemade tater tot hotdish has all of the flavors of a traditional tater tot hotdish, but really steps up the fresh game. It might not be perfect, but I think our version really shows that maybe there can be something beautiful in the hotdish. In 8×8 Casserole dish. Mix beef, veggies, and hamburger. I never heard of the term hotdish before; we just call it a casserole where I live (Canada). 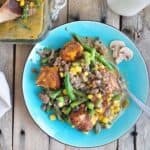 This looks like hearty comfort food to me and perfect to feed the whole family. Love that you included from-scratch recipes for tater tots and cream of mushroom soup too. This is some serious dude food right here! My dude would love it (and so would I!). This is the classic comfort food dish that I will be pinning and sharing asap 🙂 Thanks for the inspiration! Loooooove that this is totally from scratch, especially the cream of mushroom soup. 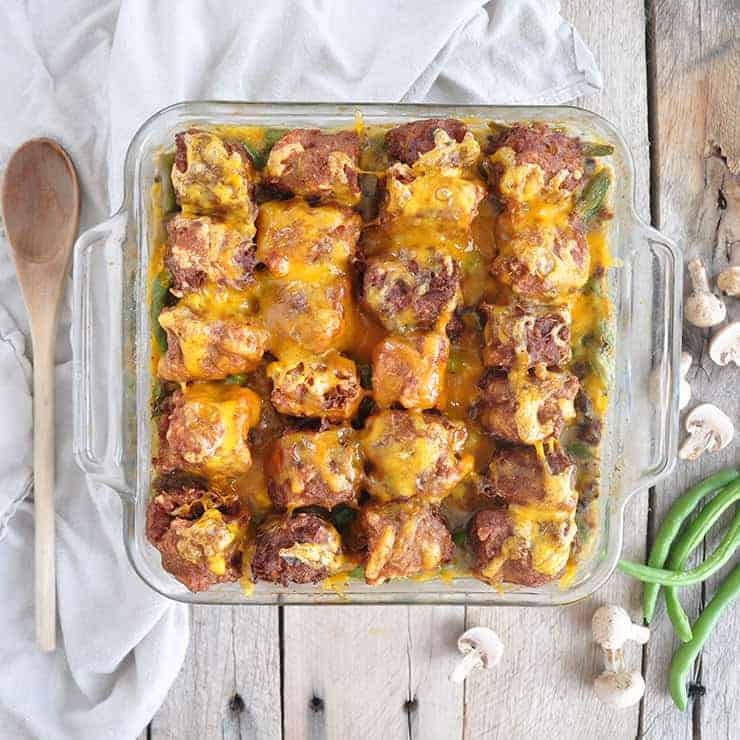 I usually don’t make hotdishes because of all the processed ingredients, but I think I have to make this one now! Plus, it looks *amazing*! Thanks for the recipe. It really looks tasty! This screams comfort food! Those tater tots look freaking amazing. Trying this soon! This is the ultimate comfort food! I need to make this tater tot goodness! Maybe I’m not a good food snob. Probably because I’m from the Midwest. But this is amazing. I have loved watching the journey of this hotdish! (Though I would call it a casserole because I’m from Missouri). Bravo. Seriously this is great! I’ve never actually eaten a tater tot casserole–scratch made or otherwise. This recipe looks amazing, and there are several components in this recipe that I can adapt and use in other recipes, as you recommended. I am particularly smitten with your homemade cream of mushroom soup recipe. It may find its way into several of my recipes. I also plan to make this recipe for a friend of mine who avoids any processed food, but says that she sometimes misses the processed foods of her youth. This recipe is the perfect solution. What a great family recipe. Full of flavor and vegetables. Okay. I’m intrigued. I’ve never heard of hotdish. I too make soup like you do, I prefer to know what goes in condensed soup!! And homemade tater tots? Yum. This looks fun and delicious not to mention pure comfort food! What a great way to combine all of your amazing recipes into one fabulous dish! Love a great tater tot casserole! Looks like such a great comfort dish for these cold, windy days we’ve been having! Oh my gosh. Definitely NEED this in my life! Looks so hearty and delicious. My hubs would love it, too! 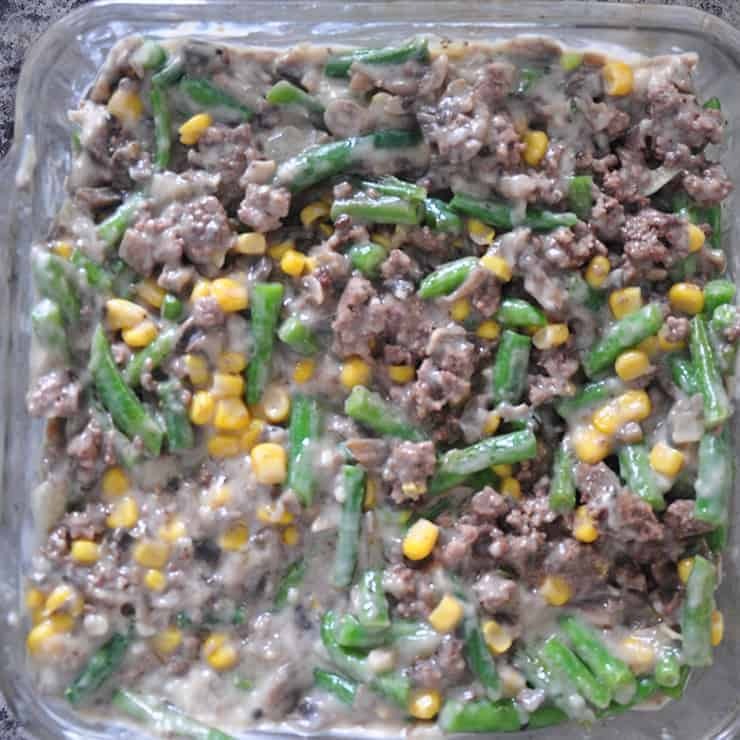 Your kind of introduced me to the whole hotdish thing with your Chow Mein Hotdish last week and here’s already another delicious looking recipe! I LOVE the sound of this one even better as I have a serious thing for tater tots! My mouth is watering! omg this seriously looks awesome! 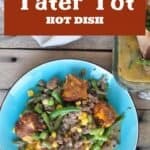 Amazing recipe with tater tots!Will keep this on my list. Would you believe that there are some food snobs out there that frown at the term casserole? Oh, but they would gobble down lasagna, eggplant parmesan, etc. Like that isn’t a casserole. Well, a rose or a casserole or hotdish by any other name is still a delicious food. Your hotdish sounds great — a meal that all families would enjoy!! Whoa! You’ve really taken tater tots to the next level here! I love how easy this easy to put together and toss and the oven. I’m going to have to give it a try. YES all day long!! Love that this is all homemade and no soup from a can! This is definitely a comforting dish and perfect for cold days to keep warm… and those tater tots!!!!! Tater Tots are my weakness. I seriously cannot resist anything that involves those little golden bites of heaven. This looks absolutely amazing and I can’t wait to try it. OMG, this was so good. Makes my mouth water just thinking of it! Your recipe took me back, way back. The 1st time I heard the word, I was eating dinner at my 7th grade buddy’s. At the table, his dad asked him to “pass the hotdish”, nodding at the casserole before us. I never heard the word for the next 60yrs ’til now. Thanks for thememory–and the recipe!